Area planning commission members Doug Ruch, left, and Lee Harman. WARSAW — Additional commercial development near Nappanee is one step closer to becoming reality. 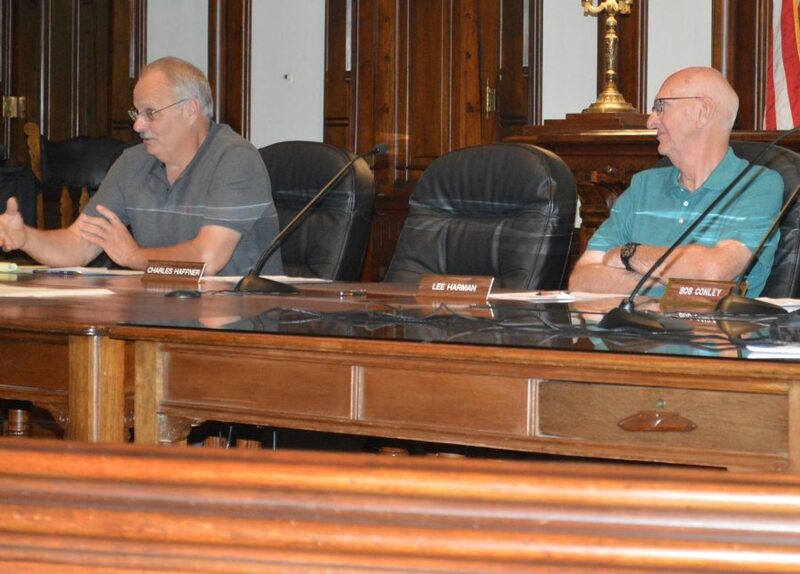 During the regular monthly meeting of the Kosciusko County Area Planning Commission Wednesday afternoon, July 11, in Warsaw, the APC recommended approval of a rezoning petition submitted by George Flowers. Attorney Steve Snyder, representing the petitioner, noted Flowers no longer owns the land, located on the north side of CR 1350N, west of SR 19 in Scott Township, just south of Nappanee. Matt Hochstetler now owns the 20-acre tract of ground through a limited liability company and he will develop the property. The petition is to rezone the property from agricultural to commercial. Corn is currently being grown on the property. Snyder said the intent is to have an office building on a 2-acre tract and to use the remaining 18 acres for a hardware and lumber store. He noted Alpha Building Supply of Shipshewana has expressed interest in having a warehouse on the property because several deliveries are already made to the Amish community in the Nappanee area. Snyder said the city of Nappanee has indicated the land may eventually be annexed. There is also a county regulated drain, the old tile type, cutting through the property and which may need to be relocated. And CR 1350N would probably have to be upgraded with acceleration and deceleration lanes to accommodate the increased traffic. Tim Stankovich, who along with his wife Jill, bought a 20-acre tract to the west said they bought the property less than a year ago at an auction and consider it their “dream property” with woods and abundant wildlife. He said he was not notified of the petition and only found out about it the previous night through someone else and didn’t have time to prepare. “I’m asking this be tabled for a month to give me time to prepare,” he said. Stankovich expressed concerns about noise pollution with a lumber yard and also increased truck traffic on what is a narrow road. Dan Richard, area planning director, said a notice was sent to the Stankoviches in June but they did not pick up the letter from their post office box. Another remonstrator, Bill Anglin Jr., said the county drainage tile is overloaded and needs to be addressed. In rebuttal Snyder said the developer acknowledges the water problem and is willing to upgrade the tile at his own expense. County commissioners will consider the petition at their July 24 meeting. In other business, the APC recommended approval of the petition by Sawyers Country Edge continued from the June meeting to rezone ground from residential to commercial on Long Drive, north of Miami Drive in Syracuse. The building is a former daycare facility. Ronald Stuckman said he wants to put an archery shop in the building and agreed to restrictive covenants that would prohibit other commercial uses and any outside storage, among other restrictions. Syracuse Town Council will consider the petition at its July 17 meeting. Also on the agenda, the APC recommended approval for Nicole Lawrence to rezone 2.02 acres from industrial II to commercial on Anchorage Road at the intersection with Rainbow Drive in Plain Township. She plans to put a cosmetology school in the building. The petition will be considered by county commissioners July 24. Jason Schwartz was given approval to rezone 2.28 acres from agricultural to agricultural II for a one-lot subdivision on CR 200W, north of CR 300N in Plain Township. The number of sell-offs from a 20-acre tract were exhausted, prompting the petition and an adjacent property owner agreed to combine two tracts of land as a trade. Mike Grady was given preliminary plat approval for a one-lot subdivision on property zoned agricultural II on Syracuse-Webster Road, west of CR 700E in Turkey Creek Township. The property is 4.12 acres and a family member will be building a home on the land. And the APC recommended approval for a vacation of a 40-foot right of way in the Old Wray Homestead subdivision just north of US 30 off the south end of Hoffman Lake. The petitioners are James Adams, Flavian Adams and Jacob Warner.